So a few weeks back, I decided to have some sushi. Me and my colleague/schoolmate were discussing the lack of affordable but delicious onigiri in Singapore. Well, she was extolling the virtues of Samurice, and I was listening, because I am a foodie, and I was looking for cheap, healthy food that didn’t burn a hole in my wallet. So I bought a group of onigiri- two for her, three for me, because I filled up the little stamp card and get to choose a free one. 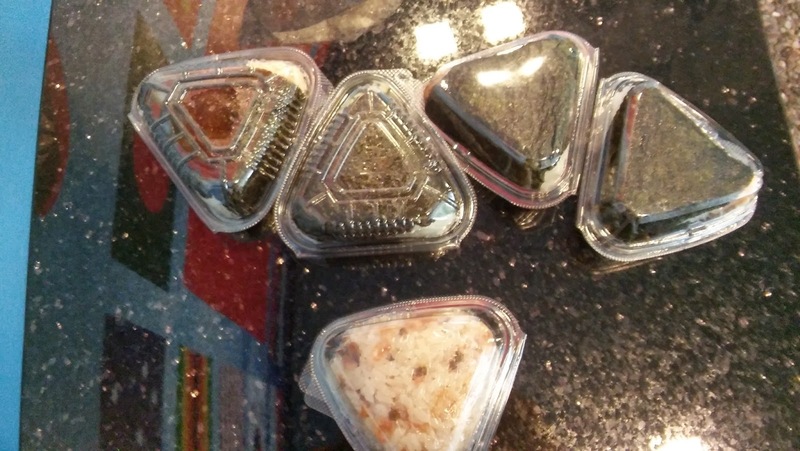 Basically, Samurice sells onigiri with different fillings. I remember buying Salmon Teriyaki and Wasabi Salmon Mayo for myself, and Roasted Salmon, I believe, for my colleague. They also have a vegetarian option, which has seaweed in it. There are several branches in Singapore. One at Raffles Place, and another at Novena United Square. So for the free rice ball, I picked an SG50 inspired one, which had salmon roe and some plum seeds, I think, in it. I can’t remember, but it was awhile ago. I thought it was funny, since SG50 was last year, and it seemed a little later, don’t you think, to jump on the bandwagon now. It also has no seaweed wrapping, but was firmly secured in cling wrap. And the taste was…weird, There’s a sour, plummy taste to it that I wasn’t expecting, but the salmon roe was nice. But I’m not buying it again, or recommending it to anyone else. Anyway, they don’t sell it anymore. I think they make seasonal rice balls, which is nice, because you get to try something new every few months without it being a permanent fixture that might or might not sell in the long run. 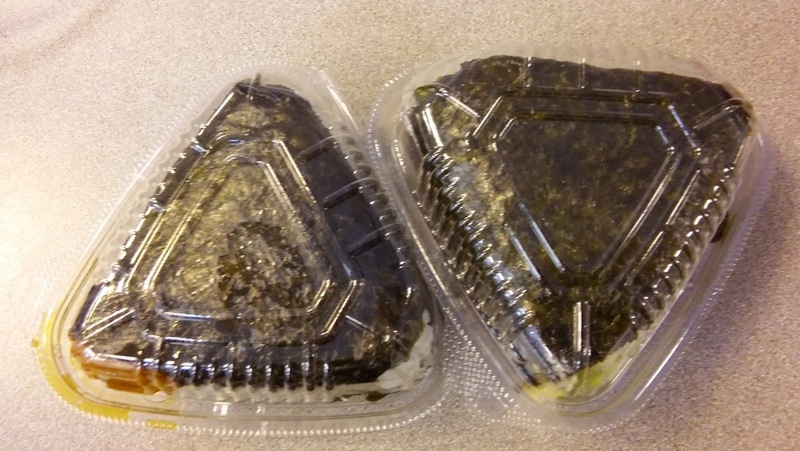 So here’s a side view of the rice balls. Salmon Teriyaki & Wasabi Salmon Mayo – Yum! One thing about good rice balls – the rice must be equally good. Samurice thrives in this, delivering a fluffy, moist and chewy rice with an abundance of seaweed, instead of the thin green strip you get at Sakae Sushi or the 50 cents sushi stall. 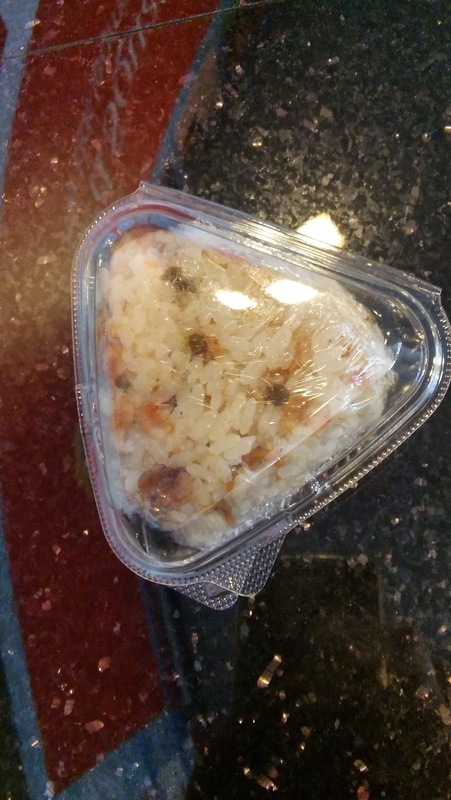 There’s also a healthy and filling amount of…well, filling to each rice ball – a little on the top so that people can see it and not make the mistake of buying the wrong rice ball, and more in the center. The rice is like the Japanese mochi rice, very good. The onigiri filling is also not overly seasoned. They are salty, but not to the level that you need to chug water or get the dry throat symptom – MSG sensitive people, you know what I’m talking about. Samurice is also a health and wellness brand, making sure that their sushi is ‘the healthy and smart choice’, according to my stamp card. Please do try it out and see for yourself. This is definitely much better than the cheaper versions, as you will be able to understand when you taste them. 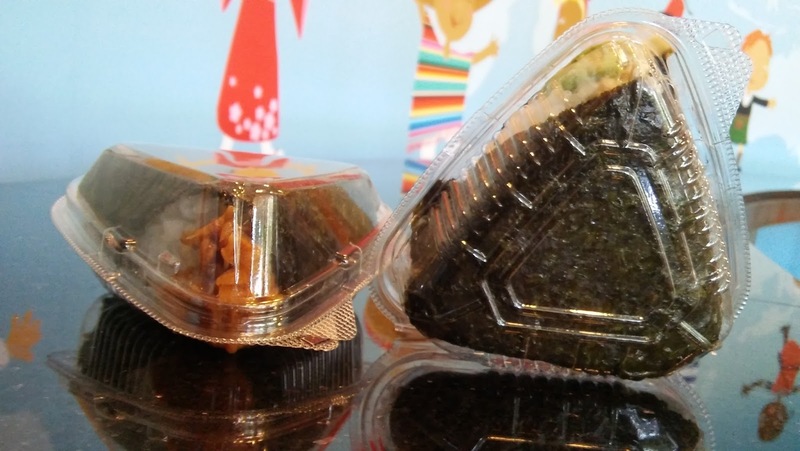 One onigiri goes for $3.00. Two for $5, and three for $8. They also have sets, and appetizers. If you eat in, you get a bowl of miso soup – not sure if it’s refillable. My favorite appetizer is the burdock root one with lotus root slices.